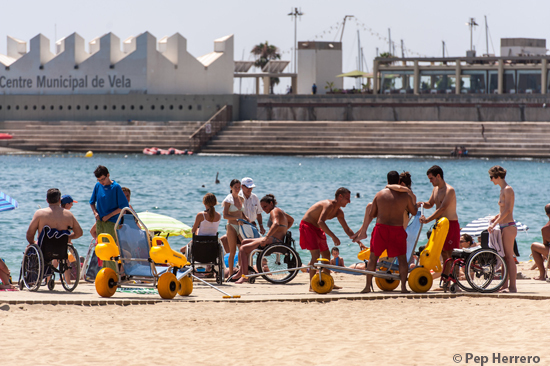 If you´re traveling to Barcelona and you´re a wheelchair user, read these 10 tips that will make your visit to Barcelona a lot easier. And you will also save money! 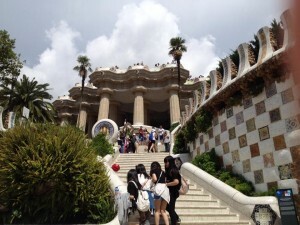 A visit to Barcelona is not complete without visiting the unfinished church of Gaudi, the Sagrada Familia. Gaudi´s masterpiece is breath taking, both inside as outside. But did you know you have free entrance as a wheelchair user + accompanying person? You should buy your tickets in advance because it can be very busy. Follow this link: https://tickets.sagradafamilia.org/site/SagradaFamilia/product/1/type/1?torres=torres-no&lang=en and select ´disabled´. They don´t offer the option to select an accompanying person, so don´t select anything because then you´ll have to pay. At the Sagrada Familia some of the attendance are not well informed about this, but it´s not possible to select the right option online. Note: the lifts into the towers are not wheelchair accessible. ALL museums in Barcelona are made wheelchair accessible! It doesn´t matter if you visit FC Barcelona museum, Miro museum, Picasso museum or the MNAC, they all have adapted access and wheelchair accessible toilet facilities. In most museums you have free entrance as a wheelchair user and an extra person has a discount. Sometimes you just get a discount. In the summer months the Red Cross offers assistance on the beach of Nova Icaria. They have a special chair you can enter the water. 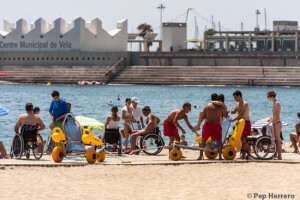 Besides this assistance all the beaches of Barcelona are easily accessible with wooden planks reaching to (close to) the water. There´re many accessible bathrooms for people with a disability. Many visitors want to stay close to Las Ramblas. Although it´s the most famous street of Barcelona, there´re many other locations in the city that are even better located than Las Ramblas. The things you don´t want to miss when you visit Barcelona are scattered over the city and as I put forward in no 1 is that public transportation in Barcelona is excellent. On and around Las Ramblas it can be very noisy, busy and a bit sinister. When you select an accommodation look at accessible public transport close by. You will need to use transportation anyway if you want to see the Sagrada Familia, the beach, La Pedrera and Casa Battló and Camp Nou. Not everything has to cost money. From Thursday to Sunday evening the Magic Fountains on Plaza Espanya play. It´s fun to see! Of course there´s the beach, but another location to relax is Parc de la Ciutadella. Don´t forget to see the fountain of Fontserre and the Arc the Triomf. The city is an open air museum with the most amazing buildings. Walk through the streets and look up and you will be surprised by the variety of styles. This is the Barcelona I love! Travelling with a handicap might make you feel insecure, especially if you arrive to a country where you don´t speak the language. At the airport of Barcelona the service is excellent and you will be helped with collecting your luggage and then brought to the arrival terminal. For those who feel comfortable travelling, they can easily take the aerobus. 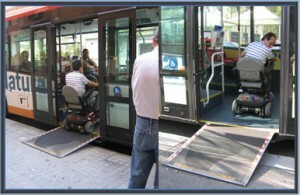 It has a wheelchair ramp: http://www.aerobusbcn.com/temas/Barcelona-eng.html . There´re always many taxis waiting, however wheelchair accessible taxis usually need to be ordered and this can take hours. Instead you can always use our airport transfer with wheelchair accessible taxi or bus. (info@barcelona-enabled.com) We will help you with the organisation and as well be available for you to help with the language. There´s no relaxer way to arrive to the city. Please realise that Parc Guëll is NOT wheelchair friendly but it´s possible. There´s a map available with the best route to take whit a wheelchair, but the roads can be uneven and d-tours are required because of steps integrated in the design of Gaudi. How to find a wheelchair adapted bathroom ? Unlike some other cities in Europe where it´s well indicated or you can even get a special key to public restrooms, Barcelona counts on its excellent name of hospitality. On every street corner there are bars and restaurants and many comply to the law offering an accessible bathroom. Sometimes you have to check a couple of bars before you find one, but in general this is no problem. Another advice is to go into a monument/museum because all of them have adapted bathrooms. And of course you can always go into a hotel. They rarely deny you access to use their facilities. My last advice is not only to recommend the services of Barcelona-Enabled, but it´s an honest advice; use a local expert. Many people don´t understand what ´wheelchair accessible´ means and forget to mention i.e. 3 steps, width of doorframe, size of lift and details about the adapted hotel room like if it has a roll-in shower. It´s not that people don´t want to help you, it´s because they don´t know what it means. By using the service of an expert specialised in travel with a disability you will be able to enjoy every moment of your visit without having to worry.